Born in Chicago, Illinois in the United States, into a large, impoverished family of immigrants. Goodman experienced hard times while growing up. Encouraged by his father to learn a musical instrument, Goodman and two of his brothers took lessons; as the youngest and smallest he learned to play the clarinet. These early studies took place at the Kehelah Jacob Synagogue and later at Hull House, a settlement house founded by reformer Jane Addams. From the start, Goodman displayed an exceptional talent and he received personal tuition from James Sylvester and then the renowned classicist Franz Schoepp. Before he was in his teens, Goodman had begun performing in public and was soon playing in bands with such emerging jazz artists as Jimmy McPartland, Frank Teschemacher and Dave Tough. Goodman's precocious talent allowed him to become a member of the American Federation of Musicians at the age of 14 and that same year he played with Bix Beiderbecke. By his mid-teens Goodman was already established as a leading musician, working on numerous engagements with many bands to the detriment of his formal education. In 1925 he was heard by Gil Rodin, who was then with the popular band led by Ben Pollack. Goodman was hired by Pollack, then working in California, and the following year made a triumphal return to Chicago as featured soloist with the band. Goodman remained with Pollack until 1929, when he became a much in-demand session musician in New York, making many hundreds of record and radio dates. 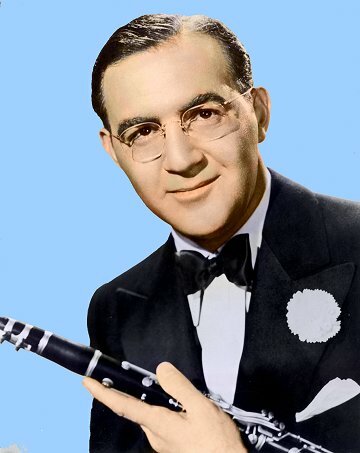 Keenly ambitious and already a determined perfectionist, Goodman continued to develop his craft until he was perhaps the most skilled clarinet player in the country, even if he was virtually unknown to the general public. During the late 20s and early 30s Goodman played in bands led by Red Nichols, Ben Selvin, Ted Lewis, Sam Lanin and others, sometimes for club, dance hall and theatre engagements and often on record sessions. In 1934 his ambitions led him to form a large dance band, which was successful in being hired for a residency at Billy Rose's Music Hall. After a few months, this date collapsed when Rose was replaced by someone who did not like the band but Goodman persisted and late that same year was successful in gaining one of three places for dance bands on a regular radio show broadcast by NBC. The show, entitled Let's Dance, ran for about six months. By this time Goodman was using arrangements by leading writers of the day such as Fletcher Henderson and Lyle "Spud" Murphy, and including in his band musicians such as Bunny Berigan, trombonists Red Ballard and Jack Lacey, saxophonists Toots Mondello and Hymie Schertzer, and in the rhythm section George Van Eps and Frank Froeba, who were quickly replaced by Allen Reuss and Jess Stacy. Goodman's brother, Harry, was on bass, and the drummer was Stan King, who was soon replaced by the more urgent and exciting Gene Krupa. The band's singer was Helen Ward, one of the most popular band singers of the day. When the Let's Dance show ended, Goodman took the band on a nation-wide tour. Prompted in part by producer John Hammond Jnr. and also by his desire for the band to develop, Goodman made many changes to the personnel, something he would continue to do throughout his career as a big band leader, and by the time the tour reached Los Angeles, in August 1935, the band was in extremely good form. Despite the success of the radio show and the band's records, the tour had met with mixed fortunes and some outright failures. However, business picked up on the west coast and on 21 August 1935 the band played a dance at the Palomar Ballroom in Los Angeles. They created a sensation and the massive success that night at the Palomar is generally credited as the time and place where the show business phenomenon which became known as the "swing era" was born. After an extended engagement at the Palomar the band headed back east, stopping over in Chicago for another extended run, this time at the Joseph Urban Room at the Congress Hotel. Earlier, Goodman had made some trio recordings using Krupa and pianist Teddy Wilson. The records sold well and he was encouraged by Helen Oakley, later Helen Oakley Dance, to feature Wilson in the trio at the hotel. Goodman eventually was persuaded that featuring a racially mixed group in this manner was not a recipe for disaster and when the occasion passed unremarked, except for musical plaudits, he soon afterwards employed Wilson as a regular member of the featured trio. In 1936 he added Lionel Hampton to form the Benny Goodman Quartet and while this was not the first integrated group in jazz it was by far the one with the highest profile. Goodman's big band continued to attract huge and enthusiastic audiences. In the band now were leading swing era players such as Harry James, Ziggy Elman , Chris Griffin , Vernon Brown, Babe Russin and Arthur Rollini. Goodman had an especially successful date at the Paramount Theatre in New York, beginning on 3 March 1937, and his records continued to sell very well. On 16 January 1938 the band played a concert at Carnegie Hall, sealing its success and Goodman's reputation as the "King of Swing.' Soon after the Carnegie Hall date the band"s personnel underwent significant changes. Krupa left to form his own band, soon followed by Wilson and James. Goodman found replacements and carried on as before although, inevitably, the band sounded different. In the early 40s he had a particularly interesting personnel, which included Cootie Williams, "Big" Sid Catlett , Georgie Auld and, in the small group (which was now a septet although labelled as the Benny Goodman Sextet), Charlie Christian. Other Goodman musicians of this period included Jimmy Maxwell and Mel Powell, while his singer, who had followed Ward, Martha Tilton and Helen Forrest, was Peggy Lee. With occasional fallow periods, which usually coincided with the persistent back trouble with which he was plagued, Goodman continued to the end of the 40s, dabbling with bop by way of a small group which featured musicians such as Doug Mettome, Stan Hasselgård, Wardell Gray and, fleetingly, Fats Navarro and with big bands which included Mettome, Gray, Stan Getz, Don Lamond and Jimmy Rowles. Goodman soon ended his flirtation with bop, but the release, in 1953, of a long-playing album made from acetates cut during the 1938 Carnegie Hall concert and forgotten during the intervening years revitalized interest in him and his career. He reformed a band for a concert tour which brought together many of the old gang; but a decision to enhance the tour's chances of success by also featuring Louis Armstrong and his All Stars was an error. The two stars clashed at rehearsals and during the out-of-town warm up concert. By the time the package was ready for its opening at Carnegie Hall, Goodman was in hospital, whether for a genuine illness, or because of a sudden attack of diplomacy, no one is quite sure. In 1955 he recorded the soundtrack for a feature film, The Benny Goodman Story , and a soundtrack album was also released which featured Wilson, Hampton, Krupa, James, Getz and other former sidemen. During the rest of the 50s and in succeeding decades, Goodman made many appearances with small groups and with occasional big bands, but his days as a leader of a regular big band were over. Even as a small group leader, his bands tended to be one-off only affairs, although he did regularly associate with musicians for whom he had high regard, amongst them Ruby Braff and Urbie Green. In Europe he led a big band for an appearance at the 1958 World's Fair in Brussells and in 1962 took a band to the USSR for a visit sponsored by the US State Department. Later, he fronted other big bands, including two formed from British musicians for concert tours in 1969 and again in 1970. From the late 60s he began appearing at regular reunions of the quartet with Wilson, Hampton and Krupa. These reunions, along with club and television dates, occasional tours to Europe and the Far East, occupied the 70s. This decade also saw, on 16 January 1978, a Carnegie Hall date which attempted to recreate the magic of his first appearance there, 30 years before. Goodman continued to record and play concert and other dates into the early 80s. In the last few years of his life and ensconced in his apartment on west 44th, Manhattan he lived quietly and is well-remembered with great affection by the local community. From the earliest days of his career Goodman was marked out as a hot clarinettist. Although he had an early regard for Ted Lewis, it was the playing of such musicians as Teschemacher and Jimmy Noone that most influenced him. By the start of the 30s, however, Goodman was very much his own man, playing in a highly distinctive style and beginning to influence other clarinettists. His dazzling technique, allied to his delight in playing hot jazz, made him one of the most exciting players of his day. Without question, he was the most technically proficient of all musicians regularly playing jazz clarinet. On the many records he made during this period Goodman almost always soloed, yet he rarely made an error, even on unused takes. During the swing era, despite the rising popularity of Artie Shaw and a handful of others, Goodman retained his popularity, even though his jazz style became noticeably less hot as the decade progressed. His dabblings with bop were never fully convincing, although in his playing of the 40s and later there are signs that he was aware of the changes being wrought in jazz. There are also fleeting stylistic nods towards Lester Young, whose playing he clearly admired. From the late 30s Goodman had become steadily more interested in classical music and periodically appeared and recorded in this context, often performing pieces which he had specially commissioned. The classical pursuits led him to adopt a different embouchure thus altering the sound of all his playing, and further attenuating the gap some felt had arisen between the current Goodman style and the hot jazz playing of his youth. As a musician Goodman was a perfectionist, practising every day until the end of his life (in his biography of Goodman, James Lincoln Collier reports that, at the time of his death, the clarinettist, alone at home, appeared to have been playing a Brahms Sonata). As with so many perfectionists. Goodman expected his employees to adhere to his own high standards. Many were similarly dedicated musicians, but they were also individualistic, and in some cases had egos which matched his own. Inevitably, there were many clashes; over the years a succession of Goodman stories have emerged which suggest that he was a man who was totally preoccupied with his music to the exclusion of almost everything else including social niceties. Goodman's achievements in this particular field of American popular music are virtually matchless. He rose from poverty to become a millionaire before he was 30 years old, a real rags to riches story. He was, for a while, the best-known and most popular musician in the USA. And if the title King of Swing rankled with many musicians and was clearly inappropriate when his work is compared with that of such peers as Armstrong and Duke Ellington, Goodman's band of the late 30s was hard-driving outfit which contrasted sharply with many other white bands of the period and at its best was usually their superior. The trio and quartet brought to small group jazz a sophistication rarely heard before, and seldom matched since; but which nevertheless included much hot music, especially from the leader. It was, perhaps, in the sextet, with Christian, Williams, Auld and others that Goodman made his greatest contribution to jazz. All the tracks recorded by this group before Christian's untimely death are classics of the form. His encouragement of musicians like Christian, Wilson and Hampton not only helped Goodman to promote important careers in jazz but also did much to break down racial taboos in show business and American society. The fact that he was never an innovator means Goodman was not a great jazzman in the sense that Armstrong, Ellington, Charlie Parker and others were. Nevertheless, he was a major figure in jazz and played an important role in the history of 20th century popular music.